There's a lot of food in Star Trek. From the weird play dough cubes they ate on TOS to the round, purple birthday cakes everyone got on Voyager, it's obvious that zipping through space gives a body an appetite. Each series has some distinct culinary options but I can't really think about Enterprise (or Trip Tucker) without thinking about pan fried catfish. Scotty had scotch. Troi had chocolate. Kira had raktajino. 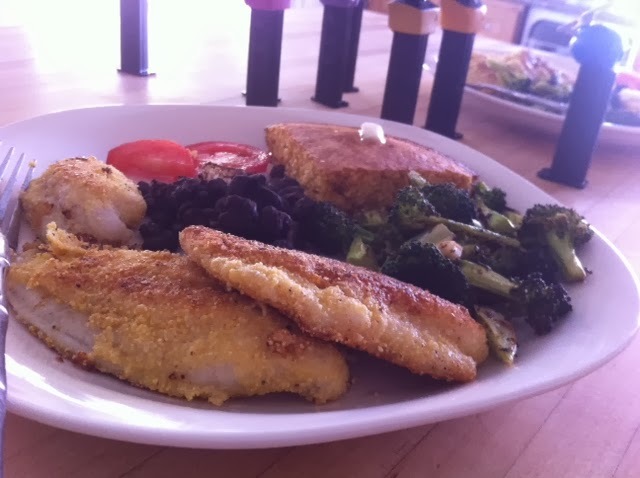 Southern born and bred Trip Tucker has pan fried catfish. He's way into it. His mom makes it. A creepy-as-hell automated space station makes it. And, because I'm also southern born and bred, I make it. And then I sat down to eat in in front of the TV where I watched four more episodes of Enterprise because I'm down to the wire. Ooo! Maybe I'll make that for Christmas!